This is the first mala I made, the one I learned with. It's not perfect and that's ok. After I made this mala, I made another for myself and one for Lisa and one for Melissa. The malas are awesome. The smooth, roundness of the beads as you touch them and the energy from the gem stones and the charms make them so sacred. It really is hard to stop touching them. 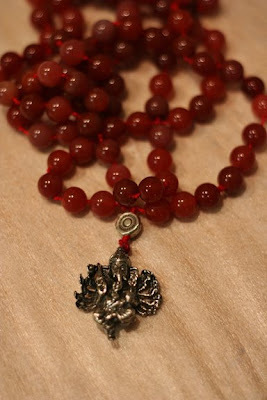 This mala is made from carnelian beads. Carnelian reminds us to be in the present moment. It vitalizes the physical, mental and emotional bodies and aligns the physical and etheric bodies. It also enhances attunement with the inner self. The charm is Ganesha. Ganesha is the remover of obstacles. I have started a new 40 day cycle which includes meditating with this mala and calling upon Ganesha to remove the obstacles in the way of my goals. I touch each bead and mentally recite the mantra, Om Gaum Ganapatayeh Namaha. Hopefully this will help with the mental obstacles that don't want me to not drink caffeine for the 40 days!